So here’s a new fundraising concept: On Saturday, October 27, the Napa City Firefighters Association is producing the 1st Annual Napa Valley Coffin Race and Halloween Festival. 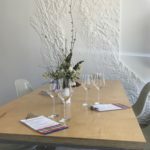 If you’re looking for something different to do, and/or another reason to go to Napa Valley for wine tasting, then here you go! What is it? A street race…of coffins…on wheels…with people RIDING the coffins. You’ve got to see this, right? Each competing team has to provide a coffin conforming to specifications (minimum and maximum size, 4 attached wheels, 4 attached handles, no functional steering mechanism). Each team must provide four “runners” to push and guide the coffin down the course. Each coffin needs a “rider” (who must wear a helmet). The race course is a little over 200 yards and each heat will be run with two coffins competing. The coffins with the four fastest times from the Qualifying Heats will then run in two Final Heats, to determine the 1st, 2nd, and 3rd place winners. The opening “Walk of Coffins” promenade is at 11:30 a.m. and the actual Coffin Races begin at 12:15 or 12:30 p.m. The Napa Valley Coffin Races will run down the streets of downtown Napa on October 27. For more details about the event, or participation requirements, please go here. That same day, the Napa Downtown Merchants will also offer Trick or Treating at stores with orange and black balloons between noon and 3:00 p.m.. If you need ideas for places to go after the Coffin Races, go here for our suggestions for some worthwhile Happy Hour destinations in Napa (several of which have Happy Hours on weekends as well). Or, you can use the drop-down menus on the navigation bar above (under “Favorites By Wine Region”) to find recommendations for winery or food destinations throughout Napa Valley. The Napa Valley Coffin Races are sponsored by the Napa City Firefighters Association (NCFA) Local 3124. The NCFA was formed in 1960 with the purpose of promoting charitable educational, recreational, and social activities within the fire department and community. NCFA also provides scholarships for youth looking to pursue careers in firefighting, and supports local charities that help youth in crisis. The primary beneficiary of the 2012 Annual Napa Valley Coffin Races will be the Napa County Library Literacy Campaign. To learn more about the Literacy Campaign, please go here. For more information on Napa City Firefighters Association Local 3124, please go here.